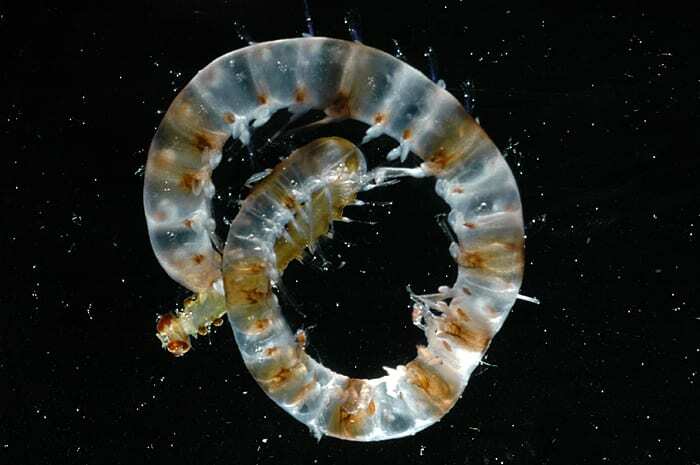 Out in the open ocean, long, thin alciopid worms swim spiraling through the water or curl into a circle when at rest. They have fragile, transparent bodies, some reaching a foot long, and remarkable big red eyes (lower left) that are as complex and developed as the eyes of a fish or octopus. Alciopids live from the surface to hundreds of meters deep and are predators, probably on soft-bodied animals like small jellyfish. WHOI scientists found this specimen on a research expedition in Antarctic waters.